Last edited by AJHasovich; 04-23-2018 at 09:44 AM. There's a point everyone's missing about oversized tires and gearing. IDK if you're the guy to dump it on, but it needs to get out there. 4th gear in jeep transmissions are about .69:1 overdrive. Why not just lock out O/D when you're offroad and need the torque? Even at highway speeds with normal size tires, it'll run about 2700 rpm which is well within normal and won't hurt the engine. I can't see spending all that money and time to swap axle gears when it's just easier to gear down. Actually running that high an rpm reduces carbon buildup. Near where I live, there is a long steep narrow winding hill with a 30 mph speed limit that puts a strain on my WJ 4.0 with 3.55 gearing. I just gear down to 2nd and she pulls up it with ease at 2000 rpm. After all, you'd do that with a standard transmission. Why not with an automatic? Last edited by dave1123; 04-23-2018 at 03:10 PM. 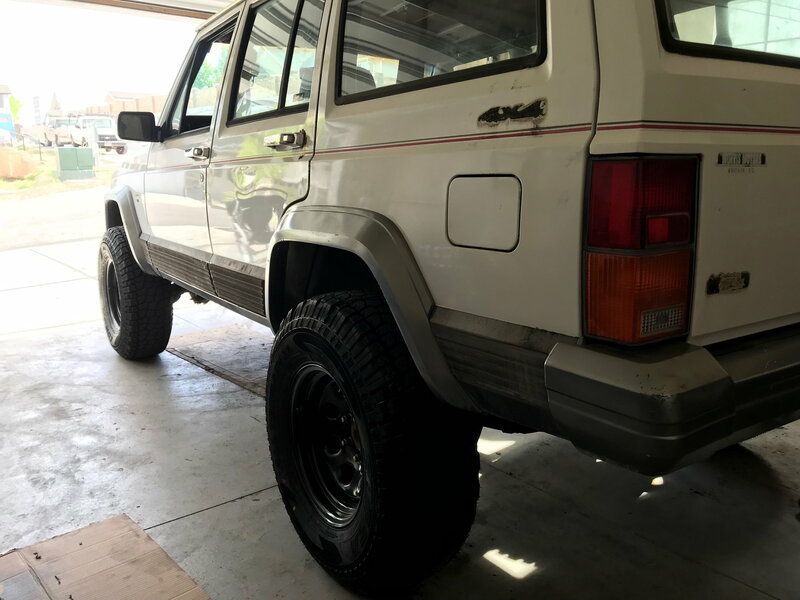 A 3 inch lift and 31" tires is pretty ideal for an XJ. You get much needed altitude under the jeep without the added expense or re-gearing for larger tires or all the additional stuff you need for talller lifts. 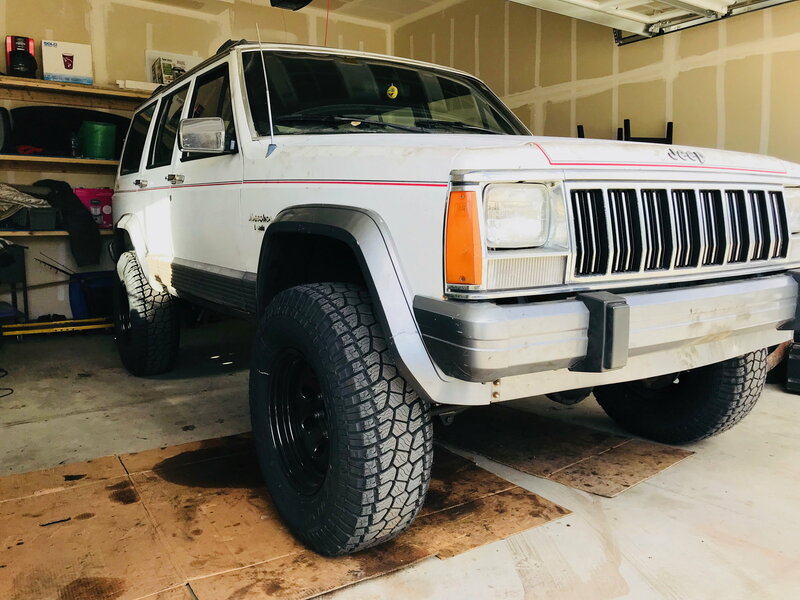 Its possible you might get driveline vibes with even a 3" lift, but a 1" transfer case drop kit would take care of that....I've had two XJ's that I lifted. A 99 that I added a 3" lift to, and then a 92 that I removed the lift from the 99 and installed it in the 92. No dirveline vibes in the 99, but the 92 did get driveline vibes. After a 1" transfer case drop the vibes were gone. Last edited by dacaur; 05-15-2018 at 09:15 PM. I went with 31 and 3 inch. No vibrations. I think it came out good. This was only thing I had budget for so far, but I am excited to build the rest of it hopefully this year. I have been running 31s, 3" lift and 31s on stock gears for a year and a half and it does fine. Sometimes I do put it in 3rd instead of overdrive, also the overdrive ratio on the AW4 is .75 not .69. Add a locker or two and you will be surprised where 31s will get you. Quick Reply: Lift kit for newbies.